DEL MAR — The San Diego Sockers announced Tuesday that they would be leaving the Del Mar Arena, their home field since 2009 when they returned to the PASL (Professional Arena Soccer League) and returning to the site of their heyday in the 1980s at the Valley View Casino Center formerly known as the San Diego Sports Arena. 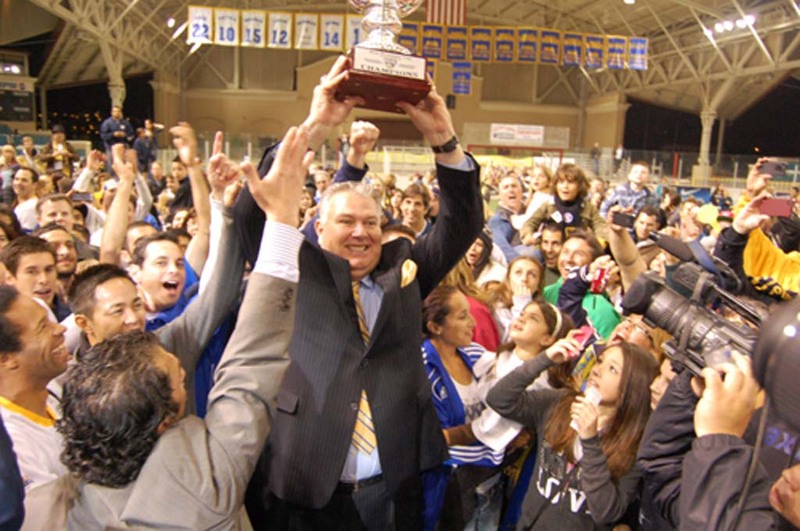 Sockers General manager John Kentera said the move was made, more than anything else, to grow the organization. “I think being centrally located, probably helps. I think a lot of people, when they think of the Sockers, they think of the Sports Arena,” he said. Kentera added that the fans will also be more comfortable at the Center, especially when there’s inclement weather. The Del Mar Arena is an open-air structure and rain could pose a problem for fans and the field. The extra space at the Center, which can hold a seating capacity of 9,000 to 14,500, will also help to increase attendance. The Del Mar Arena holds a seating capacity of 3,543. The move may also help to recapture lightning in a bottle with the team. Kentera said some of his best memories come from when the Sockers were playing at the Sports Arena. The Sockers have had a very successful season since their return in 2009, winning three PASL Championships and going undefeated last season. Kentera said the team has made tremendous inroads during the past three years in the community not only with soccer fans, but with sports fans. During the 2011-12 season 17,732 people attended the eight home games during the regular season. Figures that Kentera said he and the front office were happy with. Though there’s no question they’d like to see the figures grow. “Attendance was a little down last year, but revenues were up,” he added. As for ticket prices, Kentera said they would keep the prices the same as they are now for a month, but does expect an increase after the middle of July. “It’s not going to be a significant increase,” he said. Anybody who buys season tickets through the middle of July is going to get free parking, Kentera said. Parking will be $9 for Sockers games. In May, the team re-signed Captain Aaron Susi and PASL MVP Kraig Chiles for the 2012-13 season. They don’t see any major changes upcoming to the team, though Kentera said they may add a player or two later on. “This has been a long process to get this done and we’re very excited about it and I think people that have followed the Sockers for many, many years, this is a proud day for them,” Kentera said. The Sockers will open the season at the Valley View Casino Center this season. Their home opener is tentatively scheduled for Nov. 3.